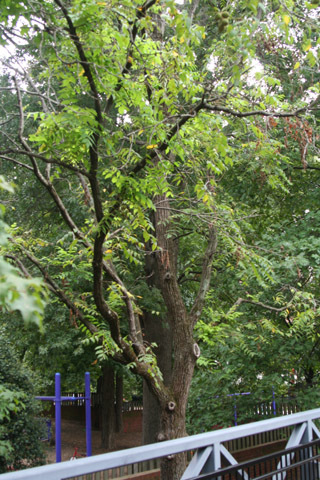 This tree grows next to the Susan Gray Playground and from the bridge you can see its branches from eye level. Because most walnut trees on campus have branches far above the ground, this is an opportunity to get a better look at the leaves and twigs of black walnut. If you are observant, you may notice that it is common for the terminal leaflet to fall off of the leaves, leaving only pairs of leaflets on either side of the rachis. This organism is a living specimen that is part of the  Vanderbilt University Arboretum  with the local identifier 1-130. Remarks: Cut down sometime in 2017.